Wally Armstrong competed in more than 300 PGA Tour events, including numerous US & British Opens, Masters, PGA and Tournament Player's Championships. In his first Master’s tournament, Wally finished fifth, setting a rookie scoring record of eight under par at Augusta. He is a Lifetime Member of the PGA Tour and holds a Bachelor’s and Master’s Degree in Education from the University of Florida, where he also achieved All-American Honors in Golf. Though Wally’s success as a pro was remarkable, his impact on the game through teaching has been even more far reaching. Legendary golfer Gary Player called Wally Armstrong "The true master of teaching the feel of the game." 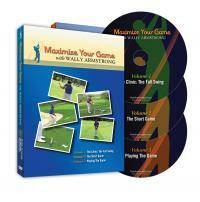 Wally has conducted clinics and seminars throughout the world, and his classic video series, “Maximizing Your Game” sold over 400,000 videos (1992-4), making it one of the most popular series in history. 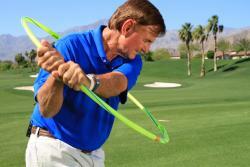 His junior strategies have also revolutionized the teaching of golf to young people. Wally is not just a teacher; he is an expert and articulate educator who makes learning golf simple, fun and easy to understand. Wally's approach to teaching (learned from yesteryear’s legends of the game), which has stood the test of time, is holistic, with the simple image of the "circle" at the heart of all his instruction – for juniors to adults and for players of all skill levels. 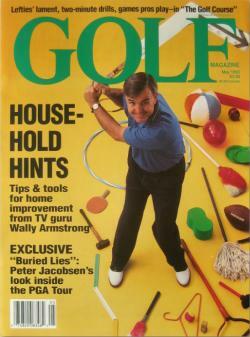 Wally’s notoriety for using common, fun props gathered from around the house or purchased at toy, craft and hardware stores as training aids and an integral part of his teaching methodology, prompted his appearance on the cover of Golf Magazine in May 1993, where Wally was labeled as the Home Improvement Guy (Tips & Tools For Home Improvement from TV Guru Wally Armstrong. Wally uses these homemade training aids and drills to first create a memorable image of the circle and then to develop the feel of the circular swing, which is the key to power and accuracy through the application of centrifugal force (swinging in a circle around a fixed axis). These "remembered feelings" are then easily translated into swinging the club, sending the ball straight and long to the target. This simple routine of seeing, feeling and swinging stands in sharp contrast to the paralysis-by-analysis of today's golf magazines, instruction and Internet tips, which are geared more to the pros, and not to the common, everyday golfer. Typical instruction tells students to consciously perform complex mechanical behaviors in sequence; this requires superb physical conditioning, and it leads to dependence on the instructor and a lack of confidence. Wally’s ways instead create independence and self-confidence, so if the feel is forgotten, one simply goes back to the image of the circle and the training aids to practice. The feel of the circle is regained, and with it the confidence and power to send the ball straight and long. Playing the PGA Tour with Nicklaus, Palmer, Player, Trevino, Watson, Miller, etc., only confirmed the truth that Wally has continued to preach all these years — that the swing is not mechanical. All the great players simply "swing in a circle by feel," where maximum power and accuracy are generated through the enhancement/application of centrifugal force. Through his videos and clinics, in his friendly, disarming way, Wally makes the average person feel comfortable and confident. His message is easy to understand and practice. He creates visual demonstrations to make his points memorable. He does not overcomplicate the game or speak in a language that only Tour Pros can understand. His genius for innovation in educational methods is clearly seen in his simple but powerful practice drills. 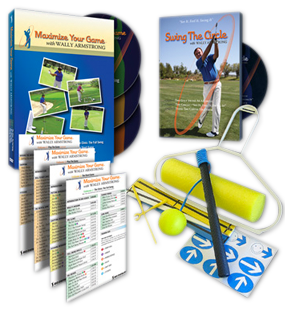 Produced Swing The Circle, a video summarizing Wally's circle teaching method, which is at the heart of all his golf instruction these past 50 years.